Norton Cyberdyne, a multinational corporation, produces high-tech military technology. Their latest super-weapon is the “SYNGENOR” (SYNthesized GENetic ORganism), a perfect “super-soldier” killing machine. Unfortunately, the prototype is loose and leaving a trail of bodies in a gruesome killing spree! As the bodies pile up, newly-spawned SYNGENORs emerge from the basement of the building and a battle rages between the mutants and the humans. The SYNGENORs must be stopped before they can escape the building and wreak havoc on the outside world! 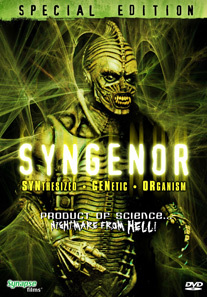 SYNGENOR features special visual effects from Robert and Dennis Skotak (visual effects creators for ALIENS and THE ABYSS) and horrific creature designs by William Malone (HOUSE ON HAUNTED HILL).